People learn better by doing. It’s what’s known as experiential learning and it is the basis of challenge courses. Leadership can mean different things to different organizations. Snuggwugg CEO Lisa Cash Hanson defines leadership as “The ability to guide others without force into a direction or decision that leaves them still feeling empowered and accomplished.” Meanwhile, interior designer Katie Easley, founder of Kate Ryan Design, defines leadership as “Stepping out of your comfort zone and taking risk to create reward.” No matter how you define leadership, you want to know one thing. How do you improve leadership? More and more, organizations from Fortune 500 companies to small businesses, religious groups, sports teams, youth groups, and scout troops are turning to challenge courses as a means to improve teamwork and ultimately improve leadership. Time and time again, we quote American psychologist, philosopher, and educational reformer John Dewey, who, in 1938, wrote that “there is an intimate and necessary relation between the processes of actual experience and education.” In layman’s terms, people learn better by doing. It’s what’s known as experiential learning and it is the basis of the challenge course experience. Research Shows That Challenge Courses Work! According to authors Catherine M. Tait, Don Rogers, Karl E. Rohnke, Jim B. Wall, who wrote “The Complete Ropes Course Manual,” challenge courses got their start in 1941 as a military tools to train soldiers. Over the years, these courses have evolved and are now readily available for public use in recreational, educational, developmental, and therapeutic settings. Challenge courses can be characterized as either low or high ropes courses. Low challenge courses are activities that require spotting (spotters) and typically focus on collaboration, communication, and problem solving, while high challenge courses are those requiring belaying and focus on building trust and learning to focus in chaotic situations. Both high and low courses are proven to be effective team building tools. Researchers Theresa Odello, Eddie Hill, and Edwin Gómez write “Data support[s] the notion that participation in a four-hour challenge course significantly increases the participants’ levels of leadership and work efficacy” and that “results were significant” and longlasting. Odello, Hill, and Gomez measured leadership and work efficacy levels pre-challenge course, immediately post challenge course, and six weeks after. “The results of this research demonstrate that programs are making a direct impact on the participants’ efficacy,” say researchers. A meta-analysis is a statistical compilation of quantitative research. Authors H. Lee Gillis, a Professor in the Department of Psychology at Georgia College & State University, and Elizabeth Speelman, the Assistant Director of Program Development for the Youth Learning Institute at Clemson University, analyzed 44 studies (2,796 participants) that examined the impacts of participation in challenge course activities. “Challenge courses are most often marketed for their team-building qualities,” explain Gillis and Speelman. “This data corroborates the common qualitative assertions regarding the importance of the relationships that are positively impacted through the use of challenge courses. Schedule Your Team Building Adventure and Discover the Benefits of Challenge Courses for Yourself! Through our highly rated team building experiences your entire group will learn more about themselves and how to work better as a team. Terrapin Adventures is conveniently located in Howard County, Maryland, between Baltimore and Washington DC. Our experienced staff is able to create a custom team building program– onsite or offsite, indoor or outdoor – that is designed to help your group increase their ability to problem solve, think creatively and collaborate with one another. We service Maryland and Washington, D.C., and have traveled to other states as well. 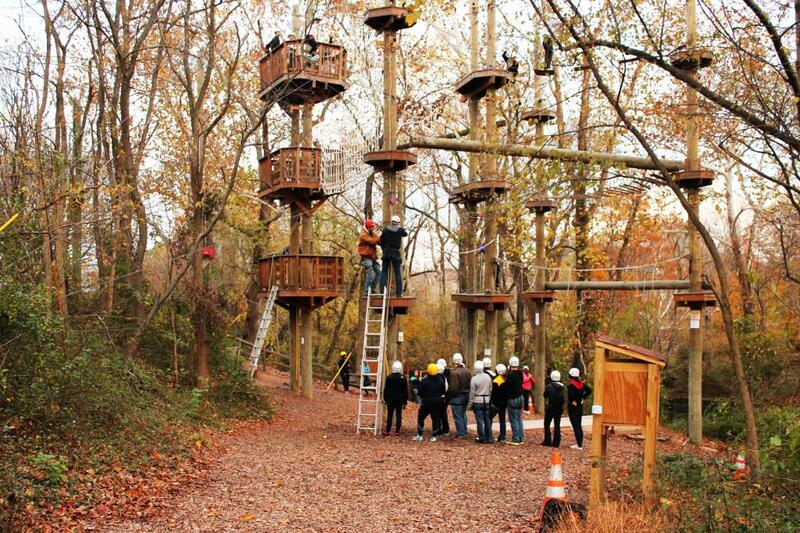 Our challenge course features three levels taking you up to 40 ft. in the air! We employ a continuous belay system, which means that you only have to secure your safety line once for each level, letting you focus on your next challenge with confidence. Terrapin Adventures develops engaging and meaningful team building programs that are inclusive for all members of your team. This entry was posted on Friday, December 11th, 2015 at 1:52 pm. Both comments and pings are currently closed. I have a small group (6) of 16 year-old Girl Scouts that would be interested in your leadership building program. Would you be able to set something up for a group this size at an affordable price for them??? ?